I unexpectedly got some very good reference this past July for ruddy shelducks, a species that I hadn’t seen much of before this trip. Some of the best photos are of a mother duck and her ducklings, swimming around in a stream surrounded by yaks. And I will certainly do a painting of that. But, first things first. I need to do a couple of studies of the adult and ducklings to learn “what they look like” and how I want to handle painting the feathers. I have no interest in rendering every feather, so I need to use the process of painting to analyze the pattern and see what I can leave out while still making it clear that I have observed shelduck feathers correctly. I’ll probably also go to Google Images before I start a larger, more complex painting so that I can get a feel for what is typical and what is unusual or where my reference might be deceiving me. 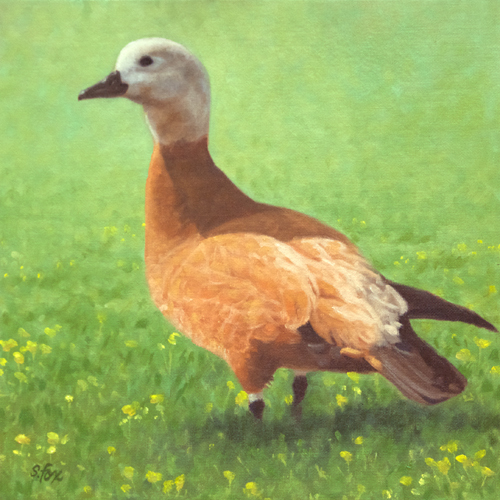 In the meantime, I did this simple 12×12″ study of a shelduck in nice light.